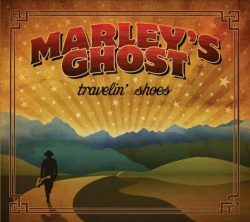 Marley’s Ghost is nothing less than a national treasure, the capable inheritors of the archetypal Americana blueprint drawn up by The Band. 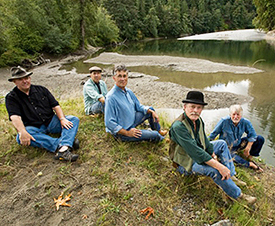 An eclectic aggregation composed of singer/multi-instrumentalists Dan Wheetman, Jon Wilcox, Mike Phelan, Ed Littlefield Jr., Jerry Fletcher, and Bob Nichols – the band can sing and play anything with spot-on feel, from roots to rock, blues to bluegrass, gospel to stone country, which is what they’ve been doing – to the ongoing delight of a fervent cult that includes many of their fellow musicians – throughout their first quarter century as a working unit. Their trademark multi-part harmonies never cease to captivate, whether on record or in live performance. The band celebrates its 30th anniversary with the release of The Woodstock Sessions, helmed by Grammy-winning producer Larry Campbell. Known for his artful work with Bob Dylan, Levon Helm, and countless others, Campbell guides the Ghost’s dig into its garden of deep roots to uncover a host of hidden gems. Featuring its trademark multi-part harmonies and multi-instrumental skills, the band’s 11th album is a resonant road trip through America’s past set firmly in the present. Campbell, a master musician of all things stringed and winner of an Americana Music Association Lifetime Achievement Award, brought Marley’s Ghost to the legendary Levon Helm Studios in Woodstock, NY after working with the group as a sideman on its previous recording, the scintillating roots-music tour de force, Jubilee. That album, produced by legendary Nashville cat Cowboy Jack Clement and recorded at the city’s venerable Sound Emporium, also features guest performances from Emmylou Harris, John Prine, Old Crow Medicine Show, and Marty Stuart. On the heels of The Woodstock Sessions, our resonant collaboration with good pal and esteemed producer Larry Campbell, we decided to return to the studio with Larry at the helm for another musical adventure. The result is a treasure trove of gone-world gospel gems, a genre beloved by us all. Official relaease date is February 8, 2019. In the meantime, here’s a song premiere of Shadrack, courtesy of our friends at Americana Highways. 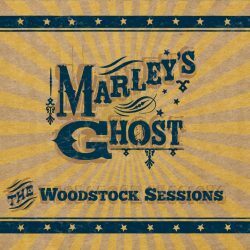 The Woodstock Sessions Is Out! We’re extremely pleased to announce the release of The Woodstock Sessions, produced by our good pal Larry Campbell. Larry is not only a master musician and all-around great guy, but also a three-time Grammy-award winning producer and recipient of the Americana Music Association Lifetime Achievement Award. The lion’s share of the album was recorded at the venerable Levon Helm Studios in Woodstock, home to more great music than we can begin to name. And working with Larry was beyond joyful. A kindred spirit who is utterly devoted to the music. Needless to say, we’re very excited about the project and encourage you to give it a listen. A multimedia performance about the coming of the plow, the tragic results of the Dust Bowl, and its echoes as a warning about our own impact on today’s environment. Through evocative songs and narration, musicians and actors forge a compelling tale from first hand accounts, various historical sources, and the sobering vantage point of hindsight. Onscreen projections augment the story with graphic images of the toll taken upon the land and those wed to it. In the late 19th Century, the land beyond the Mississippi, the Great Basin, witnessed a dramatic change that would profoundly affect its future. Large tracts of land were sold off, plows broke the buffalo grass, and wheat farmers made a killing. Less than 30 years later, poor farming practices and a cataclysmic drought created The Dust Bowl, one of the worst environmental disasters of the 20th Century. Three million people left their farms on the Great Plains; half a million of them migrated to other states. Many others stayed on, tied to the land, often at devastating cost and hardship. PRAYING FOR RAIN is a multimedia performance about the coming of the plow, the tragic results of the Dust Bowl, and its echoes as a warning about our own impact on today’s environment. Through evocative songs and narration, musicians and actors forge a compelling tale from first hand accounts, various historical sources, and the sobering vantage point of hindsight. Onscreen projections augment the story with graphic images of the toll taken upon the land and those wed to it. Original tunes, folk songs of the early settlers, the Dust Bowl ballads of Woody Guthrie, the diaries and personal narratives all combine to evoke the courage, humor, and enduring spirit of the people who lived through what’s been called “the worst hard time.” Often blinding in their intensity, the great dust storms known as the “black blizzards” of the Dirty Thirties, cast a long shadow. With its pathos and parallels to our present day lack of vision, PRAYING FOR RAIN makes for a thoughtful and resonant evening of theater and song.